• For quantitative determination of D-mannitol in biological, food, beverage and agriculture samples. • Fast and sensitive. Use of 20 μL sample. Linear detection range 0.007 to 3 mM mannitol in 96-well plate assay. • D-MANNITOL (C6H14O6) is a sugar alcohol used in dietary supplement, sweetener, intestinal permeability test for leaky gut, etc. It also serves as a coating for hard candies, dried fruits, and chewing gums due to its low ability to attract and hold water molecules. In addition, it is an osmoprotectant for plants and is used clinically in osmotherapy to reduce intracranial pressure. BioAssay Systems D-mannitol assay kit is based on mannitol dehydrogenase catalyzed oxidation of D-mannitol, which generates D-fructose and NADH that reduces a formazan (MTT) dye. The intensity of product color, measured at 565 nm is directly proportional to D-mannitol concentration in the sample. 3. Is the mannitol assay kit suitable for biological samples such as blood, urine, etc.? The mannitol assay kit should be suitable for urine and blood samples as well as other biological samples. Some samples (e.g. cerebrospinal fluid) may contain mannitol under the detection limit (3 μM); however, they should be detectable as long as the concentration is > 3 μM. Solid Samples: chop or grind solid samples. Weigh 200 mg sample and homogenize (vortex or handheld homogenizer) in 800 μL H2O (Sample:H2O = 1 mg: 4 μL). Centrifuge homogenate at 14,000g for 5-10 min. Transfer the clear supernatant into a clean tube. It is prudent to run a pilot test of the sample at different dilutions. Choose a dilution with the readings in the detection range of the standard curve for assays. Most samples can be stored at -80°C if not assayed immediately. Urine or Serum Samples: can be assayed direactly without dilution. 6. 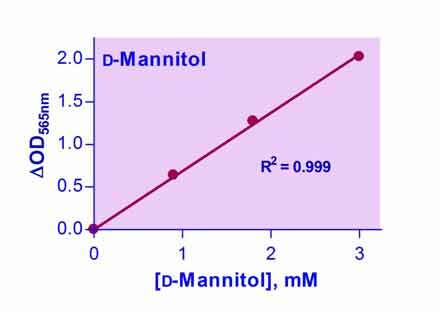 Can this manntiol assay kit detect L-Arabitol as well? Unless the L-Arabitol is > 2M, this kit is unable to detect it.